ZC Video DVD Creator 1.2.8 - Video DVD Creator transcodes and burns most pop movie files(avi, divx, div, xvid, mpeg, mpg, dat, wmv, asf, rm, rmvb, mkv, quicktime mov, flv, DVR-MS, Decrypted Vob , 3GP, Nullsoft Video(NSV)) onto DVD disc. ZC RM RMVB to DVD Creator 1.2.6 - RM RMVB to DVD Creator transcodes and burns real stream media movie files (rm and rmvb movies) onto a DVD-R/RW and DVD+R/RW disc that playable on car or home DVD player. Xilisoft DVD Creator for Mac - An easy and fast way to convert AVI to DVD, MPEG to DVD, DivX to DVD, burn DVD folder to DVD, ISO file to DVD for Mac OS to play on portable or home DVD player. Altdo DVD Burner - A professional and easy-to-use dvd burner that can burn CD, burn DVD, create ISO, burn ISO to DVD, backup data and DVD disc, data DVD copy. Allok Video to DVD Burner 1.1.0 - An easy and professional Video to DVD burner that can convert video to DVD movie and burn it onto DVD Disc, and then watch them on home, car or portable DVD Player. Ultra DVD Creator 1.7.4 - A powerful and handy DVD creator software to create DVD VCD SVCD Video Disc from almost all formats of video files including AVI DivX XVid MP4 MPEG DAT ASF WMV MOV QT etc. 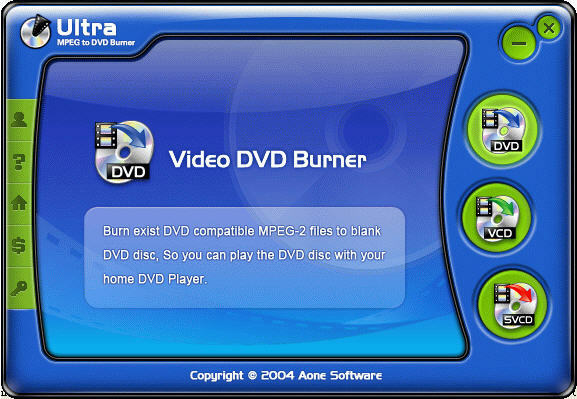 Ultra MPEG to DVD Burner 1.6.6 - A powerful and handy MPEG to DVD burner which can burn DVD compatible mpeg-2 file to DVD, burn VCD from VCD compatible mpeg-1 file, and burn SVCD from SVCD compatible mpeg-2 file. Cucusoft Mpeg to DVD Burner 3.21 - A revolutionary DVD maker software to burn MPEG to DVD. HT Burn DVD 3.2 - A powerful CD DVD burner software which can burn data CD, and create DVDs and Video CDs simply, easily, and conveniently. YouTube2DVD Burner - an inexpensive YouTube to DVD Burner that allows you to download video from YouTube, convert it into an appropriate format and burn it to a DVD or a Video CD disk. Amor AVI DivX MPEG to DVD Creator & Burner 2.2.0 - A DVD creating software which can convert AVI, DIVX, WMV, RM, MOV, ASF and MPEG files to VCD, SVCD, DVD compatible MPEG files, then burn them to a CD-R, CD+R, CD+RW, DVD-R, DVD+R, DVD+RW, and DVD-RW. Amor MPEG to DVD Burner 1.8.0 - A Powerful and versatile DVD burner software which can burn video DVD disc from exist DVD VCD SVCD compatible MPEG files, and create menu for DVD movie. Movie DVD Creator 1.02 - An easy to use but powerful DVD cloner software which gives you the fastest and easiest way to copy movie to DVD disc. Xilisoft DivX to DVD Converter 2.0.03 - A fast, easy to use DivX to DVD Converter which can burn DivX to DVD disc (playable on home DVD player). Xilisoft DVD Creator 2.0.03 - Easy dvd creator which can burn VOB to DVD, convert popular video formats such as AVI to DVD, WMV, ASF, DivX, Xvid, 3GP, MP4, MPEG to DVD and burn DVD movie. DVD Authoring Studio 2.0 - The DVD authoring program that can create a maximum of 27 hours long DVD in one double layer DVD disk, and copy DVD disk for duplication. Xilisoft MPEG to DVD Converter 2.0.03 - A fast, easy to use MPEG to DVD conversion tool, which can convert MPEG to DVD, and burn it to DVD disc (playable on home DVD player). ImTOO AVI to DVD Converter v2 - An excellent AVI to DVD converter which can convert and burn MPEG, DivX and AVI to DVD that are playable on home DVD player. ImTOO DivX to DVD Converter 2.0.03 - The excellent DivX to DVD burner which can convert DivX to DVD, burn XviD to DVD. ImTOO DVD Creator 2.0.03 - An excellent DVD burner program which can convert AVI to DVD, and convert all other popular video formats to DVD and burn it on DVD. ImTOO MPEG to DVD Converter 2.0.03 - An excellent DVD burn software which can convert MPEG4 to DVD, MP4 to DVD, MPEG1 MPEG2 to DVD and burn them on DVD, so you can play it on home DVD player. Super DVD Factory 5.4 - A DVD creator tool which can convert MPG to DVD, WMF to DVD, WMA to DVD, AVI to DVD, and so on. SwiftDisc Burning Wizard 1.96 - Burn Data DVD and Data CD, erase DVD-RW and CD-RW, create DVD ISO images, create CD ISO images, burn ISO images to DVD, burn ISO images to CD, and so on. Mooma DVD Creator 2.0 - A powerful Photo to DVD creator which allows you to create DVD from photos and video files, and convert photo to AVI/MPEG. ChiliBurner 1.1 - A powerful AVI to DVD burner which can create VCD SVCD DVDs from AVI MPEG MOV WMV ASF, and burn music CDs from MP3, WMA, and WAV audio files. WinX DVD Author 5.0.45 - A powerful DVD author software which can convert and burn video movies such as Wmv, AVI, DivX, Mpeg, Xvid, RM, RMVB, Asf files to Vide-DVD disc with advanced DVD Menu Creator. Koobo Easy CD DVD Burner 1.2 - Koobo CD & DVD Burner is a fast, efficient, and simple to use CD & DVD burning Soft. With the software you can create high-quality data CDs or DVDs quickly. Apollo WMV ASF ASX to DVD Burner 3.9.3 - Transcode and burn WMV, ASF, ASX files into a DVD±R/RW disc that playable on car or home DVD player. Apollo MPEG to DVD Burner 3.9.3 - A user-friendly MPEG/MPG video files to DVD burner software that can convert and join MPEG/MPG/VCD/SVCD video files and burn them into DVD+R/RW and DVD-R/RW disc that playable on car or home DVD player. Apollo DivX to DVD Creator 4.7.6 - Create, Burn or Convert Divx, Xvid, AVI Video to DVD+R/RW and DVD-R/RW disc that playable on car or home DVD player. It also can merge up to 4 hours of multiple movies or episodic files to standard MPEG2 Video. Apollo DVD Creator 5.3.5 - DVD creator software - Create DVD Movie from AVI, DIVX, XVID, RM, RMVB, MPEG, MPG, VCD, SVCD, WMV, ASF, ASX, SWF, MOV, DAT, 3GP, FLV, SWF formats. 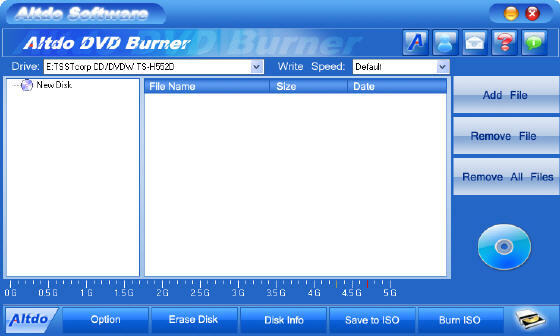 Abdio DVD CD Burner 5.2 - Abdio DVD CD Burner is an easy-to-use and powerful dvd cd burner to burn MP3, DATA, ISO, AUDIOS, VIDEOS, and IMAGES to high-quality CDs or DVDs. ALO CD & DVD BURNER 4.4 - Is an easy-to-use and effective DVD/CD burning software. With this burning program you can create Data CD, Data DVD, Audio CD, MP3 CD, WMA CD & Audio CD Ripper.